Gelfand is an example of hard work and dedication to chess for our whole generation. He’s consistent and very strict with himself. His playing style, for me, is dynamic. He loves sharp lines where each move counts. He has a feel for the initiative. He grasps very well, on his fingertips, what you can get away with in complications, and what you can’t. Of course he’s a remarkable openings expert. He’s personally plumbed the depths of some set-ups. You can learn openings from his games. Boris doesn’t cut corners and he hardly ever bluffs. If he adopts something – then there’s serious analysis to back it up. He continues to work seriously on his chess – when almost all of his contemporaries have long since ceased to do so. He follows a fitness regime, plays sport, does everything correctly. While most of his contemporaries… behave like normal people. Where Boris gets the motivation to continue this self-torture is a total mystery. Good-natured, well-mannered, intelligent, a pleasant man to know. He values his colleagues, which is something you rarely find. All in all, an example of – he’s an example! These excerpts were originally posted at the Daily Dirt here, here and here. Can anyone become a GM? In order to become a good chess player do you have to have natural talent – or is hard work enough? It’s a very interesting question, absolutely, of course, unexplored. But then, how would you explore it? What is talent? And what level of “good chess player” are we talking about? I think that practically anyone, if they set themselves the goal of becoming a grandmaster and work hard and consistently can achieve that goal, as long as they can organise their work well. But in order to become a top-class grandmaster – then, of course, you need a combination of many qualities – talent, and work, and an effective approach to work, and energy and a tough nervous system. What distinguishes an IM from a GM? I wouldn’t even know what to say. Before it was straightforward. Now there’s such title and rating inflation that it’s really difficult to know. 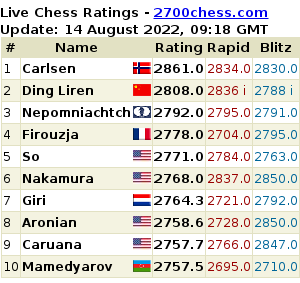 It even seems to me sometimes that some players with a rating of 2500 play stronger than others with 2650. There’s so much corruption, so many people have bought the title of grandmaster, or at least one norm! By some counts – a third. Therefore the title has been devalued and at times I’m even ashamed to call myself a grandmaster. But in general – what distinguishes a stronger player from a weaker: the range of positions which he can play; the depth that he senses and can find in a position; and endgame understanding means a lot… Though in general there are different possibilities. Chess players have many qualities. At times a certain international master knows and understands everything, but he doesn’t have a fighting character, while another plays worse, but has a really strong sporting animus, and so achieves greater success, becoming a GM. Do those who become grandmasters have an above average intellect and memory? Or can anyone who tries become a GM? Are these two qualities that can be developed, or do you need a certain mould of brain and talent? I don’t think many of my colleagues have such a high intellect, and then what do you consider intellect? As for memory, it’s well known that Spassky, Alekhine and Karpov didn’t have exceptional memories, but they were the greatest of players. And then you can name a lot of players with exceptional memories who couldn’t get beyond the first category. You need a specific memory for grasping certain types of position, typical ideas, as I’ve already said. Can anyone who wants to become a GM? It’s a complex question which I’ve already touched on. I’d repeat: it seems to me that it’s possible. Especially if you have unlimited opportunities to study 24 hours a day. Plus an enormous desire to do it – that’s the main thing – whatever it is in life you’re aiming for. On the other hand that’s not the most important goal. The main thing is, why do people play chess? It seems to me that it’s most important to do it for the pleasure it brings you. Can the intellect and memory be developed? Let’s leave the intellect aside, it’s an abstract concept. While memory can in some ways be trained. At my level I pay more attention to systemising my knowledge. So as not to remember everything, but only the most important things. And as for development… I play the game “Memory” with my daughter and have it on my computer. If children can develop their memory then adults can too… No doubt there are some methods but here the question isn’t for me, a chess player, but for a specialist in the field of psychology. I remember the Soviet Union Championship was taking place in Minsk and, as a candidate master, I went to all the rounds, sat in the hall and watched. It seems to me that this moment of empathy, sitting together with leading chess players and thinking, gives you a lot more than you’d think. If you’re on the internet and analyse with a computer, especially a lot of games at once, then it can distract you from immersing yourself in the position. I recall Alexander Sergeevich Nikitin told me at the time (he was with Kasparov at that USSR Championship): “don’t look at all the games, choose one and try to guess the move yourself, and then, at home, see whether you guessed the move or whether the grandmaster played better. And understand, why. Perhaps you were actually right”. And Boris Naumovich Postovski – also a second at that championship, I don’t remember for who. He also came up to me and gave similar advice. And I’d give the same. After all now there are on-line commentaries from all the major tournaments. So look at the games without a computer and then, after the game’s finished, compare it with what the commentator (a good commentator!) wrote. Let’s say, Sergey Shipov, who, of course thinks with his own brain, but nevertheless also switches on a computer. So first, think for yourself, and then the following day look at how the grandmaster commentated with the help of a computer. It’ll help you more. Which older chess players influenced you most, and who made the greatest impression on you? I’ve tried to learn from all players but, no doubt, I was most impressed by Yury Razuvaev and Valery Myrachvery’s “Akiba Rubinstein”. I read it again and again in my childhood. And even today when I meet Yury or we talk on the telephone we often return to that book, to Akiba’s games. The striving to play deeply in the opening, and the so-called “long plan”, that is when a game’s played from the beginning to the end in one key… That’s what I like in chess, and it comes from Akiba. I met my first trainer, Eduard Aronovich Zelkind, when I was 6 years old. He’d only been a trainer for a few years at that point. I was incredibly lucky because, as experience shows, a lot depends on what sort of trainer you come across first. The foundations that are laid out remain for your whole life. There are players at the very highest level who from their first steps in chess solved combinations – and only that! I think that’s how it was for Polgar and Mamedyarov. They have an incredibly well developed combinational vision, and they’ll have it all their lives… For us Zelkind, of course, also developed our tactical vision. I’ve still got a notebook with the first positions that he gave me. I still couldn’t write so either he or my parents would write down my homework. Bishop sacrifices on h7 are noted there… But he also taught us the endgame. At 9 years old I knew rook endgames to the same level as many current grandmasters, with no false modesty. What did I learn… Firstly, spending time with a player of such great standing is an incredible event for a boy, and some things from that time still remain with me. He said, for example: think about every move, even if you’re playing blitz – don’t simply bang out a move. Every move should have some sort of idea. I still try to follow that. Or some types of position that he would explain… I’d lose a game and he’d say: what was there to think about here, exchange one rook, leave the other, transfer the knight to here and white wins. A global kind of thinking. At the end of the 80s and the beginning of the 90s with the duels between the two Ks you were a bit of an onlooker when it came to taking part in a title challenge. Did you think then that you had the strength, that you were capable of making that step up to becoming involved in the struggle, or was the advantage of Kasparov and Karpov indisputable? Perhaps it hindered me, and continues to hinder me, that I’ve never directly thought about a title challenge. I’ve always thought about developing, how to improve my play, how to solve some concrete problems – to learn a new opening, to play a certain type of position better… Perhaps that enthusiasm, that desire to become world champion, has always been lacking in me. But of course it’s true that it was always difficult to play Kasparov. With regards to chess players becoming weaker after 40… It strikes me that it’s linked to motivation. If you don’t lose it then you don’t lose your strength. Take Anand, Ivanchuk… So if you maintain a high level of motivation I don’t see any reason why players show become weaker at 40.
Who, in your opinion, is the stronger chess player: Boris of 1990-93 and the victories in the interzonal tournaments, or the winner of the World Cup 2007-2010? (It’s worth mentioning that you are, it seems, the only person to whom such a question isn’t merely rhetorical). But why, it would also be appropriate for Ivanchuk, for instance. He played brilliantly then and plays brilliantly now. In general it’s a complicated question. I know Tal was also asked and said that “the current Tal would easily outplay the Tal who became World Champion”, you can find the exact quote in his book… It’s hard to say: then I was bolder, and now I’ve got more experience – but which is more important? !… Ian Rogers, a grandmaster and Australian journalist, said about me that of course in 93 I was stronger. Now, apparently, there are only flashes, while back then I would regularly demonstrate play of the highest level. Although, as I recall, at the time I also had collapses of energy just as I do now. After a good tournament I could be much weaker in the next. That, clearly, is some sort of global problem running over the course of my whole career, that I lacked, and lack, stability. So I’d avoid giving a definitive answer to the question… By the way: it’s not only me – chess itself has changed. Although the opponents, in essence, weren’t any weaker then. Our generation, which reached the top in chess in the early 90s – Ivanchuk, Anand, Kramnik, Topalov, Shirov… – still remains at the top today. I already mentioned the first time I lost a Candidates Match to Short, in 1991… [he described it as the most painful defeat of his career] At that time, by the way, among the match losers were Ivanchuk, Anand, myself and Korchnoi… I remember as if it were today the closing ceremony at which Korchnoi sat between me and Ivanchuk. And he said: “guys, don’t get upset, you’ve got every chance of becoming World Champion. I reached my peak playing in Bagio, aged 47… Then I played another match for the World Championship when I was 50. In this hall here there are lots of guys who shout that they’re going to be World Champion, or promise they will be. They haven’t got a hope, while you’ve got every chance. So work on it and everything will be ok”. I remembered Victor’s words and continue to work, not thinking about results, but about the process of improvement itself.